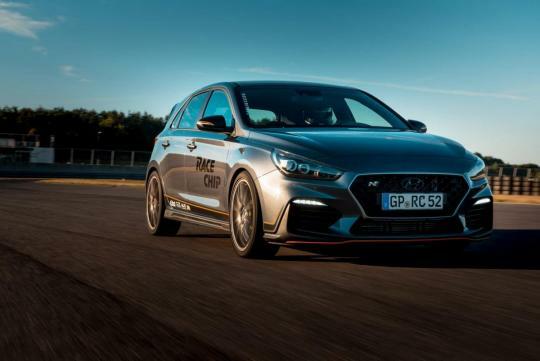 With the help of a tuning company called RaceChip, Hyundai's i30 N gets more horsepower to make sure it can keep up with some of faster hatches out there in the market. Bringing the total output of the car to an impressive 315bhp and 524Nm of torque, the guys at RaceChip managed to extract an extra 37bhp and 145Nm increase from the 2.0-litre turbocharged engine. Other than the ECU tuning, the company also used a certified downpipe to gain the extra power. Without the downpipe, the car managed to still produce a very decent 305bhp. As for the car seen in the video, a set of new OZ Leggera HLT rims wrapped with Michelin Pilot Sport 4S tyres and uprated Eibach springs make sure the car handles as well as it goes.